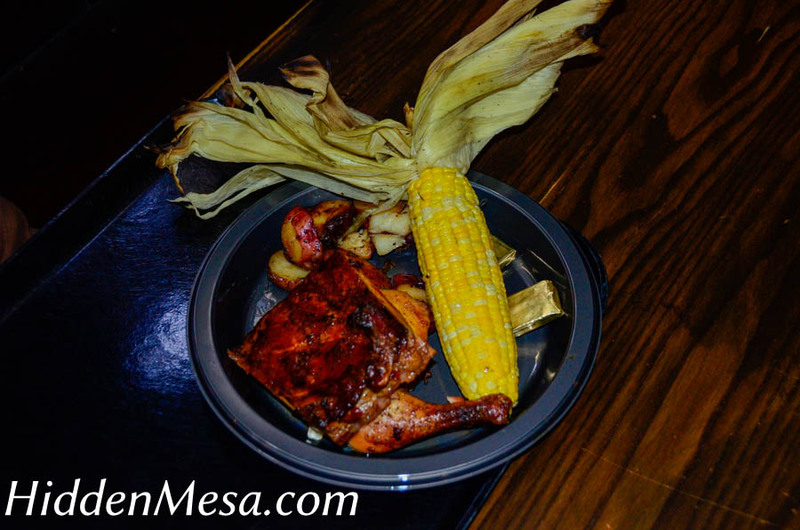 The chicken and ribs meal at the Three Broomsticks is a refreshing alternative to deep fat fried cuisine at most fast food and theme park restaurants. As we entered the restaurant, we couldn’t help noticing that the building itself was believable. You really could believe that you were in Hogsmeade and entering a real pub for a hearty meal. Our meal on this visit was roasted chicken and ribs, with corn on the cob and roasted potatoes. There was enough food in one meal for two of us, which made our lunch quite economical. On an earlier visit, we were with friends so we had the “Great Feast Platter”, which was more of the same, but served “family style”. There was supposed to be enough food for four people with this meal, but it was more like food for at least six!